I have several these drawers and all of them work great. I have not had one problem since I bought the first one 3 years ago. I use them at my Cash Registers using Epicor E4W software. Great drawer for using Square Register! 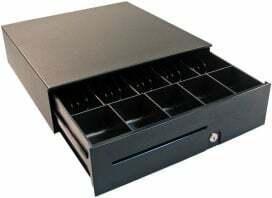 We are using this drawer in conjunction with a TSP100 futurePRINT networked printer and an iPad running Square Register. Works great. Easy setup. We were able to install the drawer easily under the desk, it integrated very well with our practice management software, and is very sturdy! Its is a simple and cost effective tool for our front office staff to use. The divider insert under the bin is effective, but doesn't want to stay straight. No major concerns. I wish the mounting hardware was included.